The Southern Programme’s main intervention zone is the Gamba-Complex Landscape, a priority landscape for WWF’s Green Heart of Africa Initiative (GHoA) and the Congo Basin Forest Partnership (CBFP). The Gamba-Complex Landscape is situated in southwest Gabon and covers 53,290km² (roughly 1.5 times the size of Yellowstone National Park). 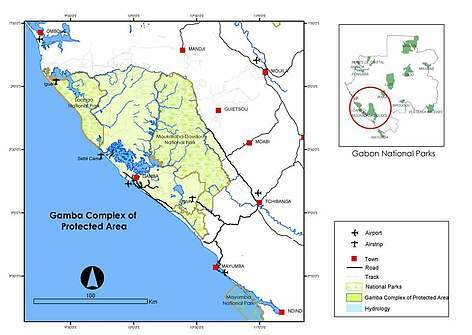 WWF works mainly in the northern part, within the 11,000km² Gamba Complex of Protected Areas. The conservation value of the Gamba Complex has been recognized for over 50 years, when the first eight protected areas were created. Parts of these areas are now covered by two of the 13 national parks created in Gabon in 2002: Loango National Park (1,500km²) in the northwest, and Moukalaba-Doudou National Park (5,000km²) in the east. In between the two national parks and other protected areas, there is a sustainably managed forestry concession of 5,685km², which is certified by the Forest Stewardship Council (FSC). The Gamba Complex’s uniqueness lies in its mosaic of diverse habitats: from seashores and mangroves, through swamp and rainforest, to semi-montane forest, savannahs, lagoons and intact rivers. Elevation ranges from sea level along the 200km pristine coastline to 700m altitude in the Doudou mountains within Moukalaba-Doudou National Park. 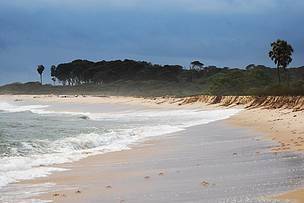 This diverse habitat favours an enormous variety of fauna and flora, with numerous endangered species. The area harbours astonishing wildlife, including elephants, gorillas, chimpanzees, four species of marine turtle, manatees, buffaloes and hippos. Just offshore, endangered humpback dolphins and their cousins, the bottlenose dolphins, can be seen swimming in the surf. Between the months of July and October, humpback whales can be observed from shore or from sea as they perform their annual migration to breeding grounds just off the coasts of Gabon. The Gamba Complex also provides world-class sport-fishing opportunities for massive barracuda, tarpon and rouge. Understanding of the structure and the ecological functioning of the coastal Ndougou lagoon basin for restructuring the Ramsar site (a designated wetland of international importance), establishing sustainable fisheries and monitoring ecological change; Environmental monitoring (turtles, cetaceans, large mammals in parks). Environmental monitoring (turtles, cetaceans, large mammals inventories). Gamba Complex lies the heart of Gabon's main economy – oil. Many oil exploitation and exploration permits cover the area, leaving WWF with the challenge to marry natural resource exploitation with nature conservation. And while oil production declines, pressures on natural resources through logging, hunting and fishing increase. The area was originally a network of small fishing, farming and hunting communities dotted around the Ndougou Lagoon and surrounding areas. Due to oil exploration, the population has grown to over 9,000, of whom about 7,500 are concentrated in the town of Gamba and 2,000 are distributed over 30 small villages. WWF has worked with the population to map and formalize the village territories and community lands used for agriculture, hunting and fishing. Petit Loango National Park Sunset with silhouette of palm trees near Setté Cama, Gabon.